Followed by a live performance - free and open to all! Already something of a legend in the time honoured fiddle tradition of Scotland, Paul Anderson is the finest Scots fiddler of his generation. Although only in his forties, he is already something of an icon in Scotland, a fact duly recognised by two specially commissioned portraits of him, a life size one in Aberdeen Art Gallery and a study which is in the care of the National Portrait Gallery in Edinburgh. In the tradition of many of Scotland's great fiddlers, Paul is a composer of some repute, having composed over 300 pieces in the Scots style. His music provided the theme tune for the film "Red Rose" about the life of Robert Burns, he composed & recorded the theme music for the PBS television show "Tartan TV" in the USA, and in 2008 he was the musical director for HMT Aberdeen's critically acclaimed production of "Sunset Song" by Lewis Grassic Gibbon. In 2008 Paul performed at a private reception for Prince Charles at Fyvie Castle to celebrate Prince Charles’ 60th birthday and in June 2010 he performed at an 80th birthday party in Edinburgh Castle for Sir Sean Connery at the request of the Scottish Government. In 2011 Paul performed at Scotland House in Brussels for members of the EU parliment and at a Burns Supper in the British Embassy. 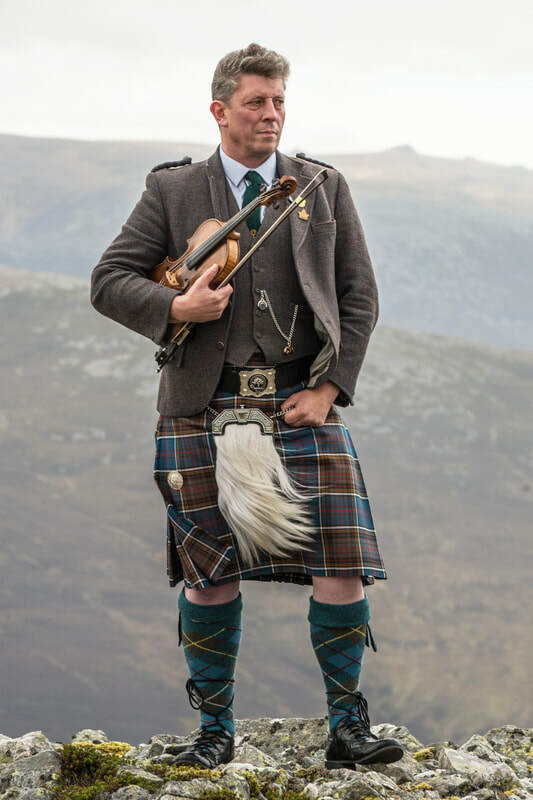 During his competitive career Paul won most of the traditional fiddle championships in Scotland and in 1995 won Scotland's premier fiddling event, the Glenfiddich Scottish fiddle championship which is held each year at Blair Castle. A regular on Scottish T.V and radio, and in 2011 he presented a series of features on traditional Scottish music and song for the BBC Scotland programme “Landward.” Paul has toured extensively and recorded eight solo albums and over forty albums with artists like Pallas, Rock Salt and Nails, The Cutting Edge and the Banchory Strathspey and Reel Society. Paul regularly recites the poetry of Robert Burns and in 1993 he played the part of the young James Scott Skinner in the play “The Strathspey King”. Paul was brought up on the family dairy farm at Tarland near the Cairngorms National Park in the heart of rural Aberdeenshire, where at the age of five he discovered an old fiddle under his grandparents spare bed, an old French violin which he plays to this day. We are excited to be able to add a performance of the Carnyx to this years festival! The Cairngorms Orchestra will be playing Paul Anderson's Heilan Symphony. This thriving new community ensemble brings together a range of keen instrumentalists from all over the National Park, rehearsing weekly under the directorship of Robin Versteeg, a local professional pianist, conductor, and church musician. Cairngorms Orchestra was founded in the spring of 2018 by a group of likeminded and enthusiastic local instrumentalists. Bringing together a range of players from all over Badenoch and Strathspey in a shared love of orchestral music - and a sense of fun! - this new community group meets weekly under the guidance of pianist, conductor, and church musician Robin Versteeg. Recent and future repertoire includes music by composers such as Bizet, Tchaikovsky, Mozart, Saint-Säens, and Leroy Anderson, and in just 6 months the membership has grown to over 30 enthusiastic musicians. Rehearsals are held in Dulnain Bridge village hall on Monday evenings, 7:30-9:30pm. There is a break for tea halfway through and plenty of time to socialise - as well as play! New members will be warmly welcomed and we have vacancies within the brass and string sections.